Recipe for making a simple and delicious chocolate cake Ingredients - 200 gm chocolate cake mix 110 ml water 10 ml oil Sugar syrup Chocolate syrup Chocolate chips 8-10 Cherries Method- 1) Mix water in the cake premix.Beat it well with a hand whisk or beater for about 5 minutes. 2) Then add oil into the mixture. Stir it well for 1 minute. 3) Mix it well. Check for a ribbon consistency. 4) Bake it. If in cooker/on gas- 45 minutes If in convection oven-as per directed through its intensity. 5) After baking, let it cool for about 15-20 minutes. 6) Cut 2-3 layers of the ready sponge. Sprinkle sugar syrup on each of the cut layers. 7) Spread chocolate syrup and choco chips. (Alternatives- chopped cherries, blueberry or strawberry crush, Butterscotch nuts) After the liquid layering spread a layer of Whipping cream( as per your taste) 8) You can decorate your cake with chocolates, cherries, gels 9) Serve it after cooled njoy the delicious cake. Icecream Batch conducted on 24th March 2018 by Vaidehi Chalke. Chocolate mousse, Cotton Candy Icecream, Rose-Gulkand dessert, Spicy Icecream, etc were taught. 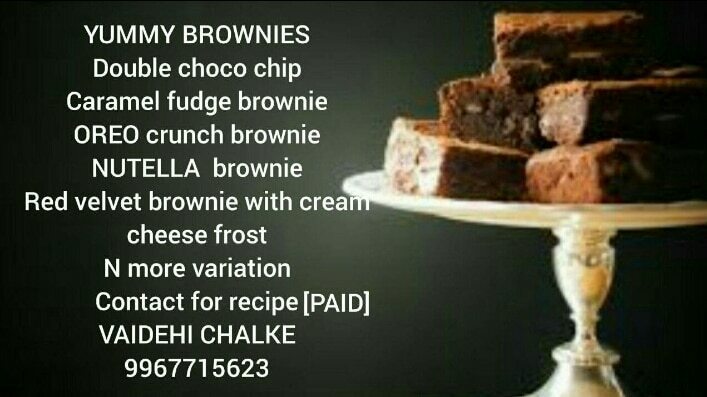 Do join and get a chance to make ur Summer delicious and cool. Cake batch conducted by Ms.Vaidehi Chalke on 8th April 2018. Doll cake , Mix fruit cake, Dripping technique, Chocolate Garnishing, etc taught. https://youtu.be/ZrrnbPa4gm4 Amazing and creative way of chocolate garnishing.... Easy and simple! !